All of Autocad graphics methods use a 3 place array of doubles for the coordinates. The simplest way to sub this is by passing the static array for the sub to fill data. This changes ptA in the calling program. Another way (a better way) is to make a function and pass the array back to a receiving variable. This requires a dynamic array. This is a better way to deal with point values. We can even get away with this – no variables at all. Dynamic arrays can accept point values. A lot of objects in autocad return point values. Autocad VBA help always uses a single variant to hold the array, because their usual point is a static array and you cannot assign to that. The same thing can be done by just dispensing with the static array all the time. For example – the utility polarpoint method returns a point value. A variant has to be declared to receive it. PolarPoint returns an array. You cannot assign to a static array. Dynamic arrays can assign. If the declaration is to a dynamic array with the correct type Double it works. There is no reason I can think of to ever declare a point except as a dynamic array. The 2300 year old geometry primer begins with definitions for point, line and plane surface establishing these concepts which will be used virtually unchanged even in modern cad applications. A point has no parts, it says. Later geometers will add it only has position but no dimension. A line has only length, no width, only one dimension. A plane surface has both length and width, two dimensions. 17th century mathematicians added XYZ variables to locate position. 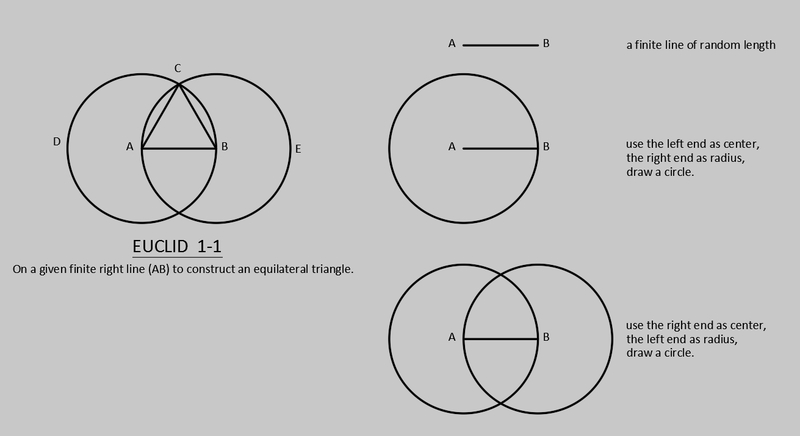 Euclid constructed, stated (“I say that…”), and proved elementary facts of geometry by starting with the most basic usable definitions and with virtual or real tools of straightedge and compass, that only allowed lines and circles to be constructed, made a textbook of geometry theorems that all depend on previous constructions for the proof of their canonic accuracy. His very first theorem constructs an equilateral triangle, a triangle with all sides and all angles equal, from a single random line. 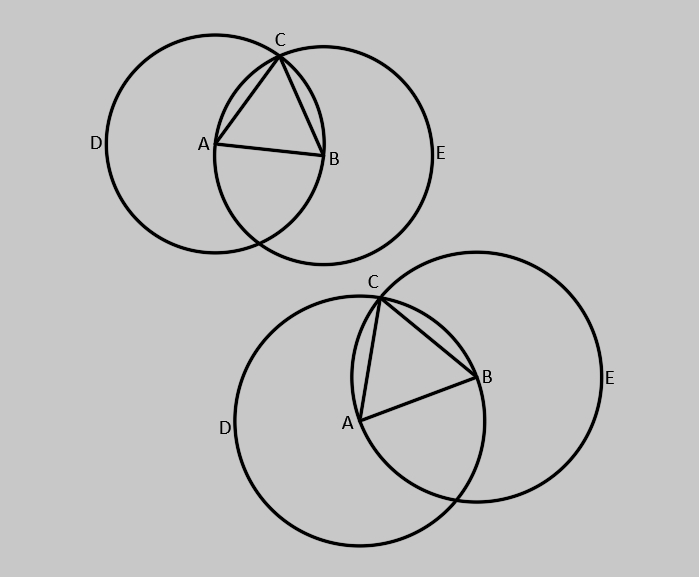 Euclid has been criticized by moderns because he included no previous definition, postulate or axiom that two circles overlapping intersect in a single point. I thought finding that intersection point would be the hardest part of programming it, but there is a dedicated method, Intersectwith, for nearly every autocad object which returns a single dimension array of x, y and z values for all intersections. Here I just choose the first one. I use a random number generator to create the seed line. MsgBox "thats a lot of points"